It’s a rostrum. 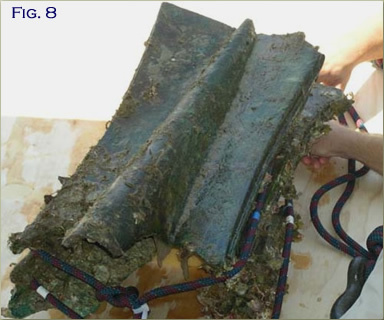 The Romans used to affix them to the prow of their ship to batter the sides of enemy vessels. 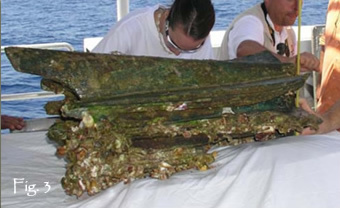 The ram was attached to the bow of a ship that was used in a 241 B.C. skirmish called the Battle of the Egadi Islands, off a body of water that has been a shipping pathway dating back to the time of the Roman Empire. The Romans traveled the waterway on their way to and from North Africa, Royal said. 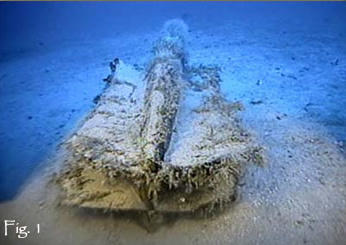 The Battle of Egadi Islands pitted 200 Roman ships against 100 Carthaginian ships. The battle was one of the last of the first Punic War and led to the Carthaginian’s surrender, Royal said. I don’t know how the archaeologists made this determination, but it’s a majorly big deal to find a rostrum in the first place (only 4 others are known) and completely unique that it can be traced to a specific battle. I pictured them shaped like rams heads, thanks to excessive consumption of Hollywood sword-and-sandal cinemascope epics, but instead they’re rather pointy and scary and eminently well-adapted to their function.